ΑΣΜΑΤΙΚΗ ΑΚΟΛΟΥΘΙΑ ΚΑΙ ΠΑΡΑΚΛΗΤΙΚΟΣ ΚΑΝΩΝ ΤΩΝ ΕΝ ΜΕΓΑΡΟΙΣ ΑΘΛΗΣΑΝΤΩΝ ΝΕΟΦΑΝΩΝ ΜΑΡΤΥΡΩΝ. ΣΕΡΑΦΕΙΜ ΔΩΡΟΘΕΟΥ ΙΑΚΩΒΟΥ ΔΗΜΗΤΡΙΟΥ ΒΑΣΙΛΕΙΟΥ ΚΑΙ ΣΑΡΑΝΤΗ.ΜΕΓΑΡΑ 1991. There are two separate circumstances of revelation of holy, unknown martyrs. The first involves the appearance of six of them to the boy Paisios (along with the discovery of their holy relics). 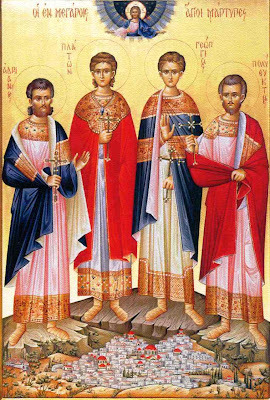 The uncovering of their relics is celebrated on August 16th (New Calendar) The second involves the uncovering of a ruined Christian church from the 5th to the 6th century, along with the relics of the other four saints. 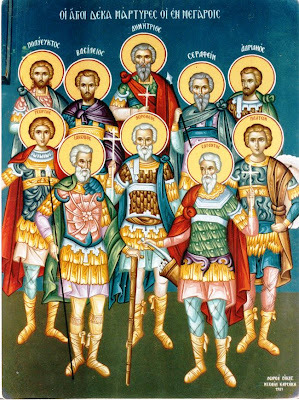 They are celebrated on February 1st (New Calendar) All together (I gather because they are revealed under similar circumstances, are probably from similar time periods, and all seem to have been martyred in or near Megara) they are celebrated as the Ten Newly-revealed Martyrs of Megara. ΤΩΝ ΜΕΓΑΡΩΝ ΠΡΟΣΤΑΤΑΙ ΑΘΛΟΦΟΡΟΙ ΔΕΚΑΡΙΘΜΟΙ * ΣΥΝ ΤΩ ΔΩΡΟΘΕΩ. ΣΑΡΑΝΤΗ, ΣΕΡΑΦΕΙΜ, ΚΑΙ ΙΑΚΩΒΕ, * ΔΗΜΗΤΡΙΕ, ΒΑΣΙΛΕΙΕ ΟΜΟΥ, ΑΔΡΙΑΝΕ , ΠΟΛΥΕΥΚΤΕ ΚΑΙ ΓΕΩΡΓΙΕ ΚΑΙ ΠΑΛΤΩΝ ΕΥΣΕΒΩΣ ΟΙ ΑΡΩΓΟΙ ΠΑΝΤΟΙΩΝ ΚΙΝΔΥΝΩΝ ΛΥΤΡΩΣΑΣΘΕ ΤΟΥΣ ΜΕΛΠΟΝΤΑΣ. * ΔΟΞΑ ΤΩ ΘΑΥΜΑΣΤΩΣΑΝΤΙ ΥΜΑΣ, * ΔΟΞΑ ΤΩ ΜΕΓΑΛΥΝΑΝΤΙ, * ΔΟΞΑ ΤΩ ΕΝΕΡΓΟΥΝΤΙ, ΔΙ` ΥΜΩΝ ΠΑΣΙΝ ΙΑΜΑΤΑ. The protectors of Megara, Champions ten in number, * with Dorotheos, Saranti, Seraphim, and Iakovos, * Demetrios, Basileios, Adrianos, Polyeuctos and George and Platon, faithful helpers of those in dangers, deliver those who cry to you, * glory to Him who glorified you, * glory to Him you magnified you, * glory to Him you grants to us through you, healings for all. ΤΟΥΣ ΑΝΤΙΛΗΠΤΟΡΑΣ ΜΕΓΑΡΩΝ ΕΥΦΗΜΗΣΩΜΕΝ, ΣΥΝ ΔΗΜΗΤΡΙΩ ΤΩ ΚΛΕΙΝΩ ΣΤΕΡΡΟΝ ΒΑΣΙΛΕΙΟΝ ΚΙ ΠΟΛΥΕΥΚΤΩΝ, ΣΑΡΑΝΤΗ, ΑΔΡΙΑΝΟΝ ΤΕ ΣΕΡΑΦΕΙΜ, ΤΟΝ ΦΩΤΟΦΟΡΟΝ ΚΑΙ ΔΩΡΟΘΕΟΝ, ΘΕΙΟΝ ΠΛΑΤΩΝΑ, ΓΕΩΡΓΙΟΝ, ΙΑΚΩΒΟΝ, ΑΝΑΚΡΑΖΟΝΤΑΣ ΧΑΙΡΕΙΣ ΤΑΓΜΑ ΘΕΟΛΕΚΤΟΝ. Let us praise the protectors of Megara, with Demetrios the noble, and steadfast Basil and Polyeuctos, Saranti, Adrianos and Seraphim, the light-bearing, and Dorotheos, and divine Platon, George, Iakovos, crying out: Hail, O Godly-chosen rank! ΧΑΙΡΟΙΣ ΤΩΝ ΜΕΓΑΡΩΝ ΠΥΡΣΟΦΑΗΣ, ΛΑΜΠΑΣ ΑΦΘΑΡΣΙΑΣ, ΕΞΑΣΤΡΑΠΤΟΥΣΑ ΤΟΙΣ ΛΑΟΙΣ, ΛΑΜΨΕΙΣ ΣΩΤΗΡΙΟΥΣ ΚΑΙΝΗΣ ΦΩΤΟΦΑΝΕΙΑΣ, ΜΑΡΤΥΡΩΝ ΔΕΚΑΡΙΘΜΩΝ, ΦΑΛΑΓΞ ΑΦΕΙΦΩΤΕ. Hail, radiant flames of Megara, that shine with incorruption, shining upon the faithful, shining with new lights of salvation, O Ten Martyrs, ever-radiant phalanx. The uncovering of the relics of the Six Holy Martyrs of Megara occurred according to a wondrous manner. In the year 1798, a boy named Paisios (who at the time was 9 years old), saw a vision of three men, dressed like equipped Roman soldiers, who told him to remove their remains from the earth. The boy related this vision to his grandfather, who not only disbelieved him, but scolded the boy. A year later, after his death, the men appeared once again to the boy, who then told his father, John, of the vision. Together, the night of August 16th (for fear of the Turks), they uncovered the holy relics, which emitted an incredible fragrance. From this time the saints, through their holy relics, began to work miracles. 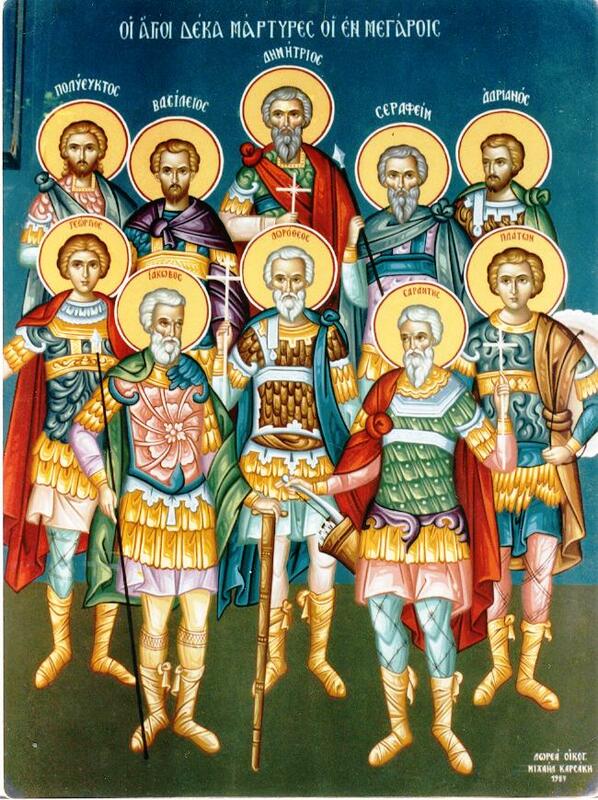 However, the inhabitants of Megara did not know the names of these saints, so they began fasting, and performing vigils and prayers for God to reveal their names. These relics were those of Sts. Seraphim, Dorotheos, and Iakovos. After a year, two other martyrs appeared to the boy Paisios (who became the protector of their holy relics) and related that their names were Demetrios and Basileios, and showed him where to dig to find their relics, a few meters from the others. With the help of other faithful from Megara, they uncovered the tomb, and venerated the relics of these two saints. After another twenty years, to the same Paisios, another saint named "Sarantis" appeared and told him to uncover his relics. Paisios took the priest John Moustaka to a rural area north of the city, and found the region among a dried creek bushes and a large stone. At first it was impossible to dig because of two enormous snakes, but having kneeled and prayed, the snakes disappeared and a luminous glow shined around the bushes. Having gathered the relics with piety and devotion, they brought them to Megara and placed them together with the remains of the five other of Martyrs. In the area where they found the sacred relics of St. Sarantis, a small country church was built later, which although situated in the bed of the river (? ), has survived until today. At 40 years of age, without ever having gone to school, and with the help of the holy Martyrs, Paisios became learned enough to be ordained a priest, in the year 1828. After his death in 1848, many pious residents of Megara who had been helped by the Saints so much, began to build a church to house the holy relics (which previously had been housed in a ruined house by Paisios). The cornerstone was laid in 1889, and soon the church to the Holy Martyrs of Megara was built on the site of their tombs. All year the inhabitants who go to the church to seek the help of the Martyrs. In 1977, on the eve of the celebration of the holy Martyrs (15 August), the founder of the Holy Monastery of Saint John the Forerunner (Makrinou), Archim. Fr. Damaskinos Katrakoulis, became very sick. It was so serious that, for the first time in his life, he thought he would be unable to attend the feast of Saints and the procession of the remains of saints. At night, the sisters of the monastery, for their consolation said to each other: «Let's leave the outer door [to the monastery] open for the holy Martyrs to pass by». And in their desperation they entreated the Saints very much to treat Fr. Damaskinos. But the loyal people of Megara, when they learned the reason for his not attending the festival, began to say with great simplicity and conviction: «The holy Martyrs will go with their horses and will make him well». In the monastery at about 11 at night and while the nuns had withdrawn to their cells,they heard a noise that sounded like horses galloping. At the same time, an unearthly light shone in the cells of several sisters, while St. Iakovos woke up one nun who was asleep. The nuns were full of joy and ecstasy, and realized that the Holy Martyrs had visited, began to gather in the cell of Igoumenis [Abbott]. And paradoxically, each of them claimed that they heared galloping outside of her own cell. With tears, deep and heartfelt gratitude and devotion, they began doxologies to God and thanksgiving to Holy God and to the holy Martyrs, who heard their humble prayer. Indeed from the time that Fr. Damaskinos was cured with the visit of the Holy Martyrs, to the glory of the most merciful God, he glorified again the holy Martyrs. A few years before that miracle, the same nuns in fact heard the festal bells of the Great Vespers for the Holy Martyrs in the courtyard of their own monastery. It should be noted that the Monastery of St John Makrinou is about 22 kilometers from Megara. 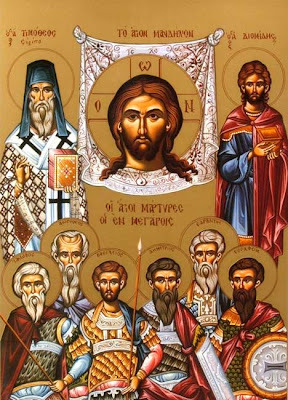 According to analysis by Archimandrite Dorotheos Mourtzoukos, the Holy Martyrs of Megara could have likely been martyred under the reign of Julian the Apostate (361-363AD), because (1) they have always appeared like equipped Roman soldiers, (2) the name "Sarants" is in reference to the Holy Forty Martyrs of Sebaste (March 9th) who weren't martyred until 320AD, and the area which included Megara was given to St. Constantine the Great by Likinios in 314AD (so it would not have been an area of persecution of Christianity, unless under the reign of the Emperor Julian). Χαίρει λάρνακα θείων λειψάνων,* πόλις έχουσα, η των Μεγάρων, * Γεωργίου, Πολύευκτου και Πλάτωνος * Αδριανού τε ιάματα βρύουσα, * και εκ κινδύνων λυτρούσα τους μέλποντας * Θείοι Μάρτυρες, Χριστώ τω Θεώ πρεσβεύσατε, * δωρήσασθαι ημίν το μέγα έλεος. Hail, O reliquary of divine relics, which the city of Megara possesses, George, Polyeuctos and Platon, and Adrianos pour forth healings, and deliver from dangers those who chant: Divine Martyr, intercede with Christ God, that great mercy be granted unto us. The relics of these saints were also found in a wondrous manner. In the year 1754, a cleric named Oikonomos (which could have something to do with being "Oikonomos" of the Patriarch of Jerusalem) wanted to build a house. When the workers of the community were digging and constructing the foundations, one of them claimed that he felt an intense heat at his feet, and indicated that he couldn't keep working. The Oikonomos put his hands in the spot, and paradoxically felt the same heat as the worker. The rest of the workers, however, kept digging until they hit a marble slab with the following inscription on it: "Λείψανα Μαρτύρων. Αδριανός, Πολύευκτος, Πλάτων, Γεώργιος" [The relics of the Martyrs Adrianos, Polyeuctos, Platon, George]. Lifting up the plaque, he found the all-holy relics of the Holy Four Martyrs, and he glorified God for the heavenly blessing and consolation which he granted to them. In the place where the relics were found, further excavations revealed a large Early-Christian Basilica which dates from the mid-5th to the 6th century AD, and which was built in honor of the Four Holy Martyrs. This filled the residents of Megara with joy, but also brought temptation, as someone during the night stole the majority of the relics and fled for the Peloponessus. However, a few smaller pieces of the relics remained, and the Oikonomos took the marble plaque to Constantinople to show the Patriarch and tell him about these occurences. Further excavations in 1998 uncovered more of their holy relics, which were placed in a beautiful reliquary and are honored joyously by the faithful. Their feast is celebrated on February 1st. See the following links for the Paraklesis (http://voutsinasilias.blogspot.com/2010/01/1-10_28.html), Akathist (http://voutsinasilias.blogspot.com/2010/01/1-10_7748.html), and Engomia (http://voutsinasilias.blogspot.com/2010/01/1-10_8853.html) of the Holy Ten Martyrs of Megara in Greek. Ἀπολυτίκιον. Ἦχος α´. Τῆς ἐρήμου πολίτης. Τῶν Μαρτύρων δεκάδα δεῦτε πάντες ὑμνήσωμεν, ἅμα Δωροθέῳ τῷ θείῳ Σεραφεὶμ καὶ Ἰάκωβον, Δημήτριον Βασίλειον κλεινόν, Πολύευκτον καὶ Πλάτωνα ὁμοῦ, σὺν Σαράντῃ Γεωργίῳ τε τῷ στεῤῥῶ, Ἀδριανὸν κραυγάζοντες· χαίρετε Μάρτυρες Χριστοῦ, χαίρετε πύργοι ἄσειστοι· πόλιν Μεγάρων ἀσφαλῶς, εὐχαῖς Ὑμῶν τειχίσατε. 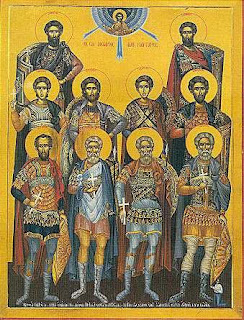 Let us all hymn the decade of Martyrs, Dorotheos the divine, Seraphim and Iakovos, Demetrios, the noble Basil, Polyeuctos and Platon, with Saranti, George the steadfast, and Adrianos, crying out: hail, Martyrs of Christ, hail unassailable towers, encircle the city of Megara with safety through your prayers.